A new set of calibration techniques employed by LUX scientists has dramatically improved the sensitivity of the LUX Dark Matter Experiment. 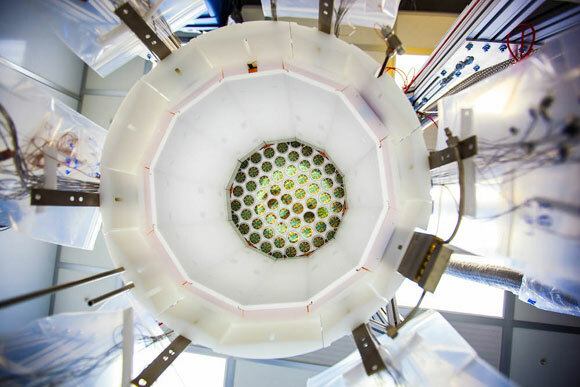 3 Comments on "New Results from Large Underground Xenon (LUX) Dark Matter Experiment"
Dark matter fills the space unoccupied by particles of matter and is displaced by the particles of matter which exist in it and move through it. The Milky Way’s halo is lopsided due to the matter in the Milky Way moving through and displacing the dark matter, analogous to a submarine moving through and displacing the water. Yes, It is true that Dark Matter is the origin of all the light matter in this universe. We know that Dark Matter consists of only 24% of the Universe whereas Dark energy is 72% leaving the reminder 4% only for all the light matter of the Universe. There is a conversion of Dark Matter to Light Matter in the Universe and the equation of conversion is unknown. A fraction converts into leptons and Baryons and the rest is propogated as Dark Energy which fills most of the vacuum energy of the empty space in the cosmos.If W+, W- and Z Bosons can create quarks and leptons,and If gluons can create particles of quarks when stretched , both being bosonic in nature, we should believe that Dark Matter also is capable of conversion to light matter. Dark Matter to Dark Matter forms clumps since they are attractive, whereas Dark Matter and Light Matter are mutually repulsive in gravitation, which is the reason for expanding Universe where the galaxies are thrown apart in high speeds. The basic characteristics of the Dark Matter is Mass and Gravity which is borne out by gravitational lensing effect of light galaxies in the cosmos. Moreover Dark Matter forms the core of the galaxies which keeps the stars of the galaxy to go round in spirals without clumping together. Dark Matter should be there in the Black Holes also to keep it intact while neutron stars are collapsing. It goes hairy in all other places and its effect on stars are not accounted. Thank YOu.